The Blue Bay Hotel is an impressive building which is surrounded by beautiful gardens with flourishing trees and colourful plantings. The hotel has a lovely pool area with plenty of sun bathing areas and a separate pool for the little ones. 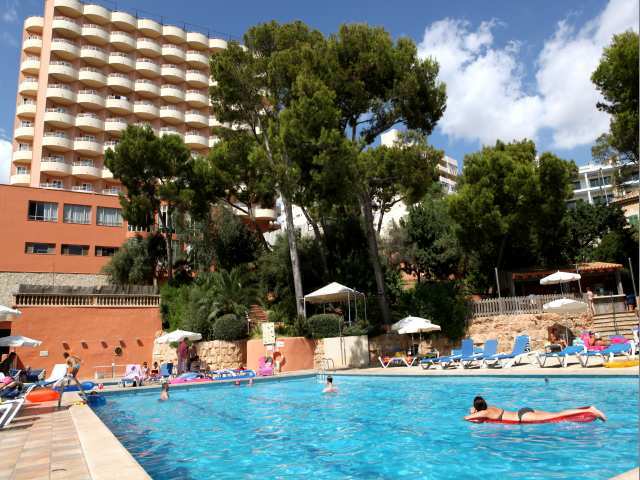 This charming hotel is situated in Cala Mayor in Majorca, an extremely popular resort, ideal for couples and families. The Blue Bay Hotel is only 500 metres from the golden, sandy beach but as the hotel sits on a slight incline, it operates a courtesy minibus every 20 minutes to and from the beach & the resort centre. This hotel offers fantastic value for money and makes your family holiday even more affordable! Local Tips: The village of Cala Mayor is a small, friendly, yet lively resort with a very hospitable atmosphere, located in the South West of Majorca and just 3km from the vibrant town of Palma. There are many shops, cafes, bars and good restaurants in town.